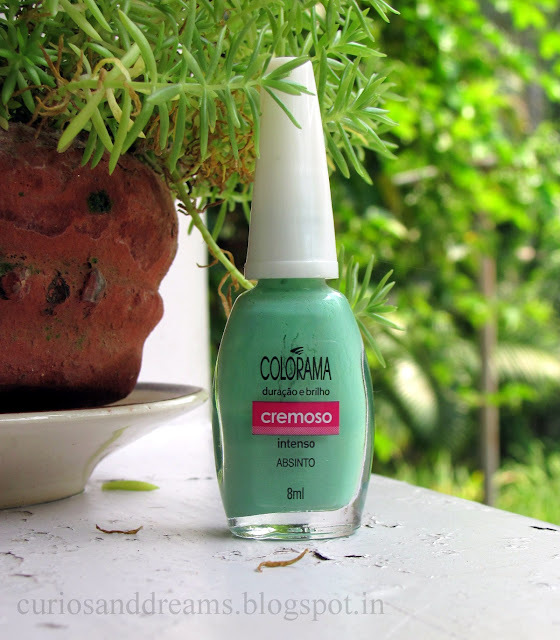 Colorama is no stranger to any of us, they've brought to us one of the most affordable nail polishes in the market. Absinto is a recent procurement of mine, and the shade just screams summer. It's a cool toned pastel green, with extremely fine shimmer of a dark mint shade. Although the shimmer doesn't translate much onto the nails, it keeps the polish from merely being a flat mint. The brush is long and moderately thin, not too much of a problem. Maneuvering around the cuticle with it is easy. The bristles have held their shape well over use which definitely earns Colorama a star, because I have had many a stray bristle incident with Lakme nail colours. Having one bent bristle ruin a smooth application process really turns me off! Coming to the texture, it appears not too thin in the bottle, but applies extremely streaky in the first coat. Extremely! Trying to even it out isn't worth your time. But yes, it does even out with the second coat, and if you feel like it, apply a third. Although Colorama says it's a Cremoso (creme) finish, I find it a bit on the sheer side. This is proven by how the intensity of green increases with each successive coat. The first coat dries pretty fast, and the second too. Third coat needs 15 minutes at the very least, so applying many thin layers is a better bet, as opposed to three thick ones. As for the staying power, three days is the norm without a top coat. However while shampooing my hair, I found it peeled right off! No trace of polish whatsoever! I don't know if it was because of the hot water, but I've never experienced this with any other Colorama polish.